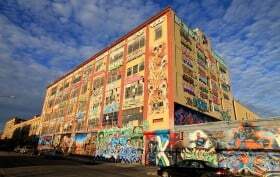 A federal judge in Brooklyn ruled Monday that the destruction of work by 21 graffiti artists at the Long Island City complex known as 5Pointz had enough recognized stature to warrant legal protection–to the tune of $6.7 million, the New York Times reports. The judgement was awarded following a landmark Federal District Court trial in November, when a civil jury concluded that real estate developer Jerry Wolkoff of Wolkoff Group broke the law when he whitewashed the building of its colorful murals under cover of night. As 6sqft previously reported, the iconic graffiti-covered warehouse, visible from passing trains since its beginnings in the 1990s as an artists’ studio and exhibition space, was razed to replaced by rental apartments–using the name 5Pointz as a marketing angle–by Wolkoff, who has owned the building on Jackson Avenue since the 1970s. Wolkoff, who claims he cried when the building came down, now has further reason to weep: The judge’s ruling awarded the artists the maximum possible damages. Starting with the news that the iconic graffiti-covered warehouse known as 5Pointz in Long Island City, Queens, visible from passing trains since its beginnings the 1990s as an artists’ studio and exhibition space, was being razed and replaced by rental apartments, the building has been the subject of heated controversy. 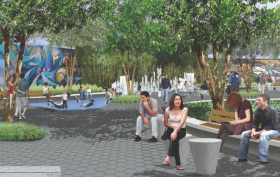 As 6sqft previously reported, in 2013 the complex was whitewashed of its colorful exterior murals under cover of night, and renderings surfaced for the rental towers that would replace it; as if to add insult to injury, the building’s owner, Jerry Wolkoff of G&M Realty, revealed plans to use the name 5Pointz as a marketing angle for the new development. Several attempts were made at intervention–and prevention of a similar fate for artists’ spaces since then. Now, the New York Times reports, a federal lawsuit filed by 23 5Pointz artists against Wolkoff, who ordered the art destroyed, is getting its day in court. On March 31, Judge Frederic Block of Federal District Court in Brooklyn ruled that the federal lawsuit against Wolkoff, who ordered the artwork destroyed–could have a jury trial, an incremental legal victory for the artists and a chance to confront Wolkoff in court to seek redress. It’s been 19 months since the 5Pointz graffiti mecca was secretly whitewashed overnight by the developers who have since razed the site to make way for the two residential towers that will replace it. 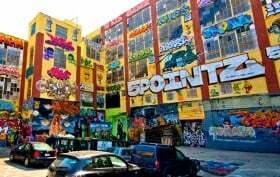 Then, to pour salt in the wound, this past November G&M Realty announced that they planned to use the iconic 5Pointz name for their new project, infuriating the artists whose work adorned the building and leading them to launch a petition to stop the title. Now, the plot has thickened. Nine graffiti artists filed a lawsuit on Friday “seeking unspecified damages from the owner who whitewashed away their artwork,” reports the Daily News. The plaintiffs claim they’re owed financial compensation as they were not given the opportunity to retrieve their work, much of which could have ended up in museums or the artists’ personal collections. The lost collection amounts to more than 350 graffiti pieces. Back in November we first got wind of G&M Realty’s plan to trademark the 5Pointz name and use it for their new residential towers at the site; now artists connected to the Long Island City graffiti mecca are fighting back. Father-son developers Jerry and David Wolkoff had their trademark application denied twice, most recently on January 6th, for being too similar to a California real estate company. Before their third go, artist Jonathan Cohen (aka MeresOne), who ran 5Pointz for ten years, has started an online campaign advocating to protect the storied name. So far the petition has 2,050 signatures, with a goal of 3,000.